Martin Caceres has been suspended from the Juventus first team and fined after his alleged involvement in a drink-driving incident. 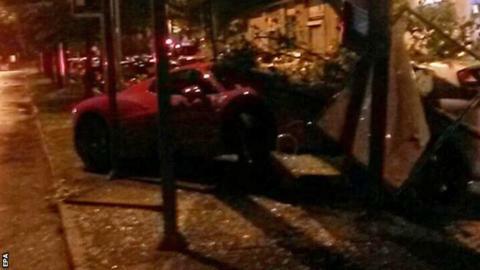 Italian news agency Ansa reported the Uruguayan, 28, was over the alcohol limit when his Ferrari crashed into parked cars and a bus shelter in Turin. Juve stated the defender's behaviour on the night of 28 September was "a gross violation" of his duty to the club. Caceres joined the Serie A champions in 2012 and has won four league titles. He also helped the side reach last season's Champions League final. The statement added: "Juventus will thus taken disciplinary action against the player in the form of a fine and his temporary suspension from the first team." The Italian club, who meet Sevilla in the Champions League on Wednesday, are already without several players through injury, including Sami Khedira, Claudio Marchisio, Stephan Lichtsteiner and Mario Mandzukic. Captain Gianluigi Buffon said his team-mate "knows he's made a mistake". "Obviously it was bad timing, coming two nights before a big game like this, but he's understood and he's sorry," he added.